A lump sum based on direct assessment by experienced personnel. Until the project is complete, no one can be certain exactly how much the cost will be. The basis for the estimate and the calculations used to turn that information into a cost are both uncertain. Other factors may come into play as well, such as unexpected changes in the design, the scope of work, or the way work is to be carried out. Relocation and travel costs for specialist personnel recruited outside the region in which the project is to be conducted. Experienced estimators build in these allowances, not as cover for risk but as costs they expect will be incurred based on experience. They might aim to make their estimate lean (i.e. low, with few additional allowances), a likely outcome or conservative (i.e. high, including most additional allowances), depending on their personal nature, organisational policy or management pressure. Estimators’ allowances overlap with what are regarded as project risks in a cost estimate. An allowance might be made for wet weather but there could be more or less wet weather than expected. An equipment cost might include provision for air freight not included by the supplier but, when the project is planned in detail, it may be possible to use lower-cost sea freight for delivery. The fact that estimators make allowances for the same kinds of variations as appear in a risk assessment can create confusion. To gain a clear view of the cost and all the uncertainties affecting it, it is essential to look carefully at the base estimate and how it was produced. The base estimate is the estimate produced before project risk is taken into account. On large projects, the person producing the estimate will often be a specialist estimator. On smaller projects, it might be prepared by a business analyst, a project manager or other personnel. As is explained in the next section, it is common to find that some provision for risk has been embedded in the estimate even before the risk to the total cost is assessed. This provision has to be integrated with a wider consideration of risk to understand the uncertainty in the total cost. Some organisations demand lean project estimates, with no allowances for anything not explicitly detailed in the estimate inputs. Others expect the estimator to produce an estimate that is the most likely outcome for each part of the cost, failing to understand that this will not usually produce a total estimate that is the most likely outcome of the total cost. This is an important misconception. Without going into the detail here, when a set of quantities with uncertain costs are added up, under most conditions the mean value of the total will be the sum of the mean values of the individual components. The same is not true for the most likely values, also called the modes, or percentile values such as the P10, P50 or P90. There is usually pressure to keep costs low, so few private-sector organisations ask for a generous estimate with more than the usual level of allowances built into the component costs. A different approach may be taken where the elevated cost is a mechanism to help negotiate a safe budget with a separate funding authority or client, as might arise with a public sector project. However, while it is not unheard of, it is unusual to find an estimate that already has adequate cover for risk before it has been analysed and a risk-based contingency has been set. Clearly, before analysing it, there is no particular reason to believe that an estimate provides a reliable view of the most likely outcome for a project’s cost or is lower than the most likely outcome or, rarely, is on the high side. Some estimates are generous and some are very lean. To get a realistic view of the range of possible project cost outcomes, it is important to understand the way the estimate has been prepared. Uncertainty in each of the components of a project estimate results in uncertainty in the total estimate value. 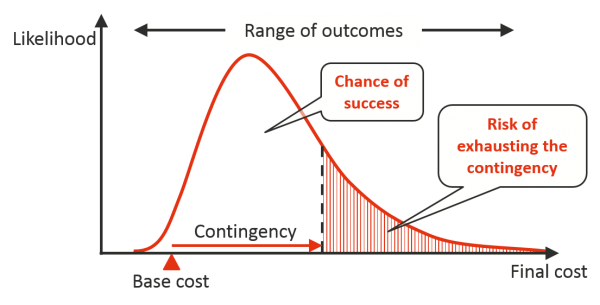 The chances of achieving a targeted cost outcome depend on the relationship between this uncertainty in the total cost and the target that is selected, as illustrated in Figure 1. The area under the cost distribution either side of the target value is a measure of the chance of success to the left and the risk of failure to the right. If an organisation can choose where to set the target project cost, it can influence its chances of meeting the target. It can vary how much confidence it will have in being successful and how much risk it will have of failure, depending on what target cost it sets. In reality, with a dynamic environment and active involvement of the project management team, a forecast such as this made at the start of a project is only a guide to the final cost and the risk of failing to meet a target. It is a valuable starting point, though, and a useful basis for deciding how to balance the desire to meet the target against other pressures, such as commercial and business performance goals, that tend to drive the target cost down. It also provides a basis for seeking approval for the project budget. One way to think about setting a budget is as a decision on where to set the target in relation to the uncertainty in the forecast final cost, moving the vertical line in Figure 1 to the right (increasing the budget) for less risk and to the left (decreasing the budget) for a more aggressive target. However, the decision is not usually considered in terms of the target itself but in terms of how much has to be added to the base estimate to place the target where the project wants it, as in Figure 2. This is the contingency allowance. The risk of remaining within or exhausting the contingency is exactly the same as the risk of falling below or above the target in Figure 1. The base cost almost always lies toward the lower end of the range of realistically likely outcomes for several reasons that can be summarised, very loosely, as optimism and oversights. 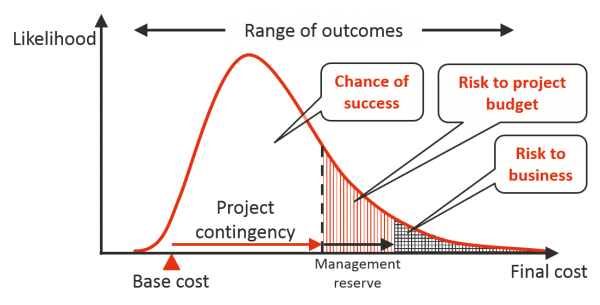 Some organisations calculate two levels of contingency, often labelled the project contingency and the management reserve. The project contingency is available to the project manager, either directly or through a case-by-case release mechanism. The management reserve is an additional amount held to protect the business against the project exhausting the contingency and needing additional funds. This is illustrated in Figure 3. The risks affecting a project are often seen as something separate from the estimate but this is an unrealistic separation. As pointed out earlier, an estimator makes many assumptions when deciding what to include in the base estimate. In addition to allowances included for costs not reflected in the estimate inputs, some estimators also include an estimator’s contingency for individual components of the estimate. The definition of the estimator’s contingency varies. It might be to cover identifiable items the estimator feels have been overlooked, anticipated growth in quantities as a design is refined, lack of confidence in the people supplying the input data or the estimator’s own view of the risk associated with a cost item. In practice, it is impossible to obtain an estimate free from judgements made by the estimating team, the engineers that produced the design, the suppliers who provided quotations and others who contribute to building up the cost. All these features of the base estimate preparation and the uncertainties more commonly regarded as project risks have to be taken into account to understand the uncertainty in the forecast of final cost and to set a contingency. Confining the risk assessment to matters outside the base estimate is unrealistic, and trying to separate the uncertainties built into the estimate from those arising elsewhere is unhelpful. There are several ways to understand all these uncertainties and how they affect the total project cost. Rules of thumb and experience are still used by some estimators, even on substantial projects. Parametric techniques are popular in sectors where there is sufficient data from past projects and where current projects are broadly similar to those used to develop the models. The most common approach is to use some form of Monte Carlo simulation model. The most useful and realistic form of model for most projects is based on risk factors, supplemented with event models and other simple structures where necessary. An illustration of two risk factors, relating to uncertainty in the quantity and unit rate for a bulk commodity on a construction job, is shown in Figure 4. Inputs to such a model, the ranges and distributions of the risk factors, have to be gathered in a manner that limits bias, especially optimism and anchoring biases. A structured process of exploring assumptions and possible outcomes is illustrated very briefly in Figure 5. 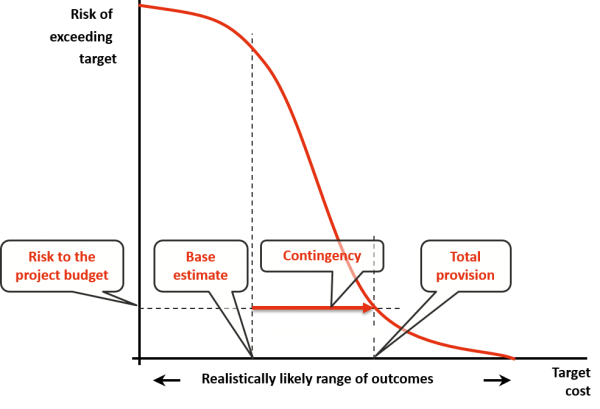 The output of a Monte Carlo simulation model of project cost uncertainty is typically summarised in the form shown in Figure 6. The cumulative form of the distribution, as opposed to the density distribution in Figure 1, Figure 2 and Figure 3, makes it easier to see the relationship between the contingency and the amount of risk being taken. The contingency is used to cover costs that were not included in the base project estimate. Some of these might be clearly associated with specific risks included in the analysis that was used to calculate the contingency. Others may be less clearly identified with a particular cause. Requests to utilise contingency are one means by which the effectiveness of cost control can be monitored. Care is required to avoid the contingency funds themselves being expended without proper control. There is no generally accepted approach to contingency management. Some organisations place it under the control of the project manager. Some hold it centrally and demand a careful justification for funds to be released. Others delegate parts of the contingency down the management chain, holding some at the business level, some at the project level and some at the work package level. These are details that depend on an organisation’s general management practices and its cost recording and control systems, and they interact with the way it deals with targets and performance incentives. At the overall project level, depending on the duration of a project, it may be useful to re-evaluate the contingency from time to time. The balance between the contingency and the uncertainty in the forecast cost to complete the remaining work can change as the project is implemented. If the contingency is used up more quickly than expected and no savings can be found to compensate for it, the risk of exceeding the target cost will grow. If the contingency funds are not required to the extent expected and some costs turn out lower than estimated, the project might have very little risk of exceeding its target. If a policy is adopted of trying to maintain a steady level of risk, it might be necessary to revise the plan of work to find savings if the risk rises and it may be possible to release some of the contingency if the risk falls. Contingency funds released from projects that are doing well may be diverted to others that are struggling, to balance a portfolio of projects, or diverted to other organisational requirements, or taken as profit. A project cost contingency is chosen to set the level of confidence a project team wishes to have that their budget will be adequate. It requires an assessment of the uncertainty in all elements of the project cost. This is usually developed using a Monte Carlo simulation model. Two levels of contingency are sometimes derived, one to cover the project and one to provide the business or project owner with cover against a project over-running its budget. Management of the contingency funds might be focused at one level in the project and its governance structures or distributed among the management levels, depending on the way the organisation deals with targets, performance and incentives.